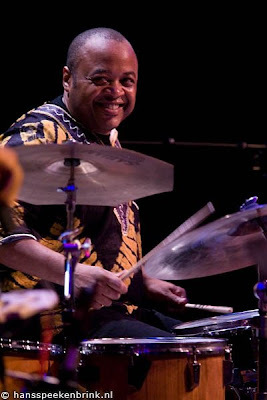 If you see Jeff "Tain" Watts playing the drums you understand why he earned his nickname "Tain" which is short for mountain. Like a mountain he sits relaxed behind his drum set while his arms seem to be all over the place. In the meantime he's looking around and gives a big smile when one of the band members is giving it all. Watts may be one of the most wanted drummers in the jazz scene right now and for a good reason. He can play killer grooves as he proved with a funky tune but also play great swing or low volume slow tunes. But of course he's at his best when he can play energetic composition that suit his intense style best. He was constantly challenging the other members of the quartet: Marcus Strickland on saxophone, Lawrence Fields on piano and Chris Smith on bass. 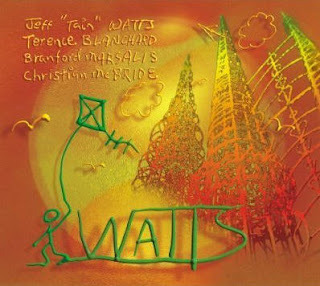 They played some tunes of Watts' latest album simply called "Watts" that is a vary diverse album but also compositions of his other albums and songs he wrote for the Branford Marsalis Quartet. Watts introduced the band and the songs at the beginning of each set so they didn't have to interrupt the set itself. He proves he is a skilled composer and he can write furious tunes. But many times with a light touch that is sometimes obvious as well from the song titles: "Devil's Ringtone", "Blakzilla" and "Brekky with Drekky"
Marsalis is playing on the new album but Strickland is a worthy replacement. Lawrence Fields was doing a great job on the piano. His style is very relaxed and light. Watts pushing them to give it their best made it a high quality performance. He's proving that he's definitely one of the best jazz musicians of the moment and will bring many nice things for the years to come.